Sometimes, little changes can have a big impact. Each of these 10 updates will take you less than 10 minutes to complete, but the impact will look like hours of effort. 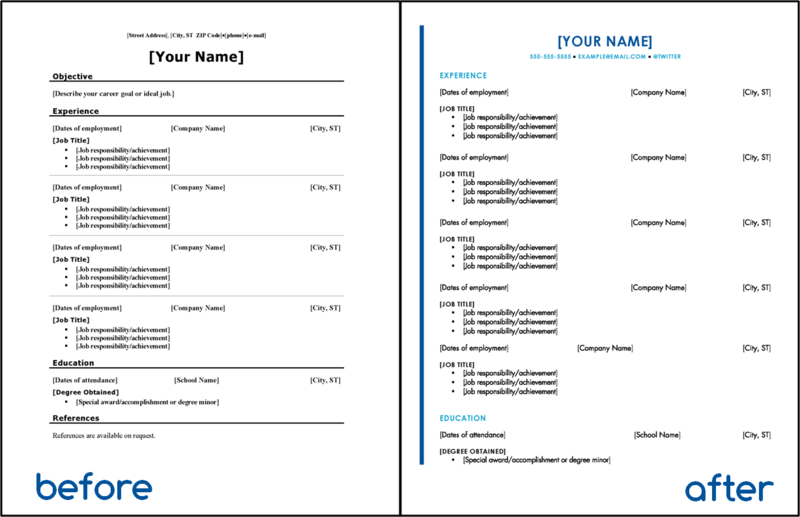 We applied these updates to a basic Microsoft Word resume template. Even without updating the content, take a look at the difference. It’s likely your resume is going to be looked at on a screen, so save the recruiter or hiring manager a few clicks and add a hyperlink to your email address, LinkedIn profile, relevant social media or digital portfolios. 2. REMOVE UNNECESSARY OR IMPLIED INFORMATION. Your objective – If you’re sending your resume to a job posting, chances are your objective is to get that job. References or “references available on request” – If they are going to hire you, they are going to request references, so have them ready, but use the new space to add more accomplishments to your resume. Consider removing your address – Worst case scenario, your address and commute time is a factor in a recruiter’s decision. Even in the best case, your address doesn’t make you more qualified for a role. Instead, use that space to highlight an accomplishment or replace it with your LinkedIn profile or digital portfolio. Caveat: If you just moved to a new city and your past employment is all out of town, knowing you already live in the area says you don’t need to relocate. 3. REARRANGE YOUR WORK EXPERIENCE AND EDUCATION. In almost every situation, your work experience is going to be a better indicator of your qualifications than where and when you went to school. Caveat: If you are a very recent graduate with very little work experience, or work in a highly specialized field requiring a specific field of study, then you may want to consider leaving your education first. A little color in a sea of black and white, and your resume is going to pop off the screen. Know your industry and keep it professional. If you’re looking for inspiration, look at company logos in your industry and pay attention to colors you see a lot. Colors evoke emotion, so pay attention to what you want to project. This infographic shows company logos and the emotions their colors suggest. Like color, you might be surprised how much of a difference this makes. Almost everything is more exciting than Times New Roman and using something interesting will grab the attention of the recruiter. You can be more creative with a font used sparingly, like those found your header or as section titles, but remember to keep everything easily readable and professional (read: no script fonts and no Comic Sans. Also, know that some fonts are designed for digital use (i.e. Georgia) and some are designed for print use (i.e. Times New Roman). Don’t forget to run the grammar check as well. 8. PRINT A HARD COPY. You get a different perspective when you’re looking at your resume on paper versus a screen. A hard copy is great for a final edit (read it out loud and mark it up with a pen), noticing small formatting mistakes (use another sheet of paper or a ruler to make sure everything is exactly lined up on the page) and getting an overall visual of the resume (it should be visually appealing). Save your resume as a PDF. You might have a Mac and the recruiter may have a PC or vice versa. Word processing programs open differently and formatting changes per computer. Saving as a PDF ensures the recruiter sees exactly what you see, and opens on every device. Rename the file – Use a file name that includes your first and last name, and the word “resume.” The easier you make it for the recruiter to find your resume in a folder of files named “Resume,” the better. 10. SEND IT TO A FRIEND OR COLLEAGUE. Two sets of eyes are always better than one, and a friend or colleague is likely to catch something you missed. Bonus points if this person is also someone you’ve worked with, or is in the same industry, because they might remember an accomplishment you haven’t represented.